Addison Pest Control is the bee, wasp and hornet specialist. We have never failed to eliminate a infestation. Finding and removing the hive is usually the quickest and safest way to eliminate a bee or wasp population near your home. Addison is committed to supporting the Toronto pollinating bee population. We work with a beekeepers to relocate beneficial pollinators to a safe environment. 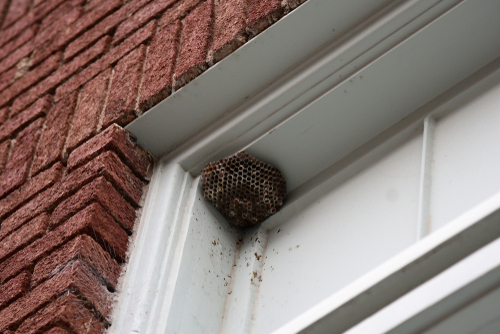 Most bees and wasps create mud or paper nests on protected overhangs, tree branches, eaves, garages or porches. Carpenter bees bore deep galleries into wood timbers and can cause significant structural damage. Many bees and wasps form large complex hives with thousands of members. Most bees are beneficial pollinators whereas most wasps are aggressive scavengers. Most bees can only sting once, whereas wasps can sting a potential repeatedly. A professional integrated pest management plan is the best way to quickly and completely eradicate a stinging insect infestation and give you safe, long-lasting protection. Most stinging insects are closed up inside and removed or relocated. Immediately removes all stinging insects. Does not introduce insecticide into outdoor environment. allows beneficial pollinators to be relocated to a safe environment. There can be thousands of bees in a single hive, the right techniques and products are necessary to ensure, the queen is eliminated along with the rest of the colony. 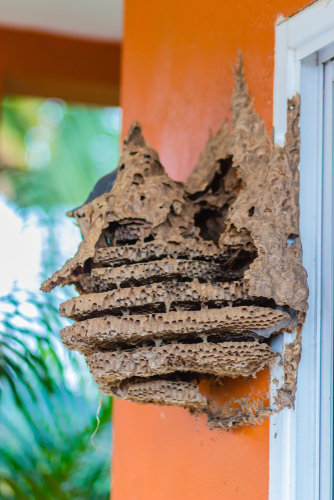 There are many preventative measures you can take throughout the warmer months to deter and prevent bee and wasp nests from becoming a nuisance. Some people use the term bee, wasp and hornet interchangeably, but there are many differences in their behaviour and anatomy. In general, bees eat nectar and pollen while wasps and hornets scavenge for meat, cheese fruits, vegetables and other plant or animal foods. Wasps are more aggressive and can sting repeatedly. Bees, on the other hand, are less aggressive and less likely to sting, since most bees die shortly after stinging. The insect family Hymenoptera includes bees and wasps as well as ants and sawflies. Pollinator Bees are equipped with a long sucking tongue called a proboscis for lapping up nectar and leg combs for cleaning excess pollen from their antennae, head, and abdomen. Wasps are equipped with strong and well-developed mandibles and chewing mouthparts for burrowing into fruit and meat and preying on other insects. Both wasps and bees have two sets of wings, a narrow waist petiole and two large compound eyes on either side of their head between which are several smaller simple eyes, which generate information about light intensity. Having clear and complete information about the species, life cycle, foraging and reproductive habits of bees will help you get the most out of a bee treatment. Bees are a part of the third-largest insect family called Hymenoptera, which includes bees and wasps as well as ants and sawflies. Bees themselves are incredibly diverse with over 20,000 known distinct species. Some species breed and forage in a solitary nest, while other species form complex hives with a defined caste structure. leg combs for cleaning excess pollen from their antennae, head and abdomen. Hatched larva develop quickly and pupate within the larval cell. The pupal stage will normally last only a 1-2 days and an adult emerges from the larval cell shortly after. Most adults emerge throughout the springtime, the males emerging first and beginning their search for female mates. Worker bees have the widest variety of tasks and duties within the nest. central purpose is to mate with a queen from another colony. Drones are unable to sting and do not gather pollen. A handful of wasp and hornets cause distress and economic loss in this North America. Even though yellowjackets and baldface hornets are actually beneficial species that feed on other invasive insects, if a nest is located close to an occupied structure it may be necessary to remove it. Wasps queens will seek an enclosed protected area to begin their nest construction in the mid to late spring. Wasp nests are commonly found in tree stumps, on the underside of tree or bush branches, a gap in brickwork, inside of a space in soffits or on the underside of eaves. attracted to sugary and protein rich foods such as meat, fish, cheese, bread and fruit. The life-cycle of social wasp species is very similar to that of bees, with the notable difference that it is very rare for a wasp colony to last more than one season. How do I know if I have a bee or wasp infestation? Bees and wasps are a normal and beneficial part of the urban ecosystem. It is normal to see bees wasps around the home and garden especially around picnic, barbecues, sporting events, etc. If you see intensified bee or wasp activity in your home or garden, a bee or wasp hive is close by. Nests are usually easy to spot, as you will always see elevated activity around that area. Bees and wasps will behave more aggressively when they feel their nest is threatened. 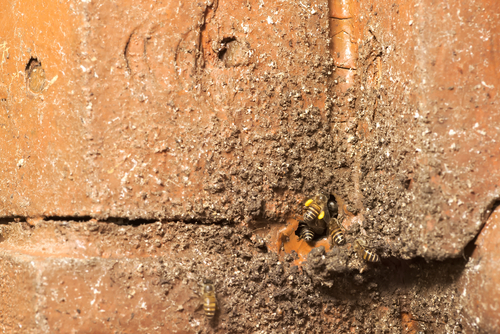 If bees or wasps have formed a colony in a wall void, a chimney, a soffit or a garage it may be necessary to take action to prevent your home from becoming overrun with stinging insects. Either removing the hive, or implementing a residual insecticide pest management plan to keep you protected from an infestation. Addison offers a thorough inspection service for wasps which involves a 360° inspection of your home, crawl spaces, attics, garages, tool sheds and decks. By identifying carcasses and live insects and locating the nest we work with you to establish an effective, safe and environmentally sound pest control strategy. Here are few things to be on the lookout for particularly in the spring and early summer, to help you spot a bee or wasp infestation as early possible. bee and wasp nests vary considerably from species to species. How did bees or wasps get into my home? What do bees and wasps eat? How serious are bees and wasps? should only be controlled if pose a risk to human health or significant financial loss. inspecting the yard, the eaves and wall cavities early in springtime can make nest removal very easy. many people have severe anaphylactic reaction to bee and wasp venom which can be life threatening if they do not receive emergency medical attention. Can I prevent bees and wasps on my own? bees are disinterested in human activity and are a beneficial keystone species in the ecosystem. Because of the risk of stinging or swarming, we advise customers to allow our expert technicians to address a bee infestation in their home. Addison guarantees the elimination of a bee infestation quickly and completely with minimal environmental impact. When a wasp is threatened it releases a distress pheromone which will attract related wasps to come to its aid. Protective clothing is essential to ensuring that wasps cannot sting during removal. After maintaining a smoke treatment for up to 3 hours, it is safe to knock the nest down with a stick, wrap in a plastic or cloth bag and dispose of it in the regular garbage. place the bag in the freezer for 48 hours or in a bucket of water with a weight to keep the nest bad submerged overnight to ensure that all wasps are killed. Freezing or drowning it is safe to dispose of the nest in the regular garbage. store-bought insecticides can be toxic, ineffective and environmentally damaging. At Addison we combine chemical and physical control methods to ensure that a wasp infestation is eliminated quickly and safely with the minimum impact on the environment. We us a combination of non-toxic residual pyrethroid spray and a crack and crevice treatment to ensure any wasps in wall voids or soffits will not be able to survive. Give us a call for a full explanation of our treatment process and no-obligation transparent quote.